Slice each hot dog into 4 (1 inch) pieces. 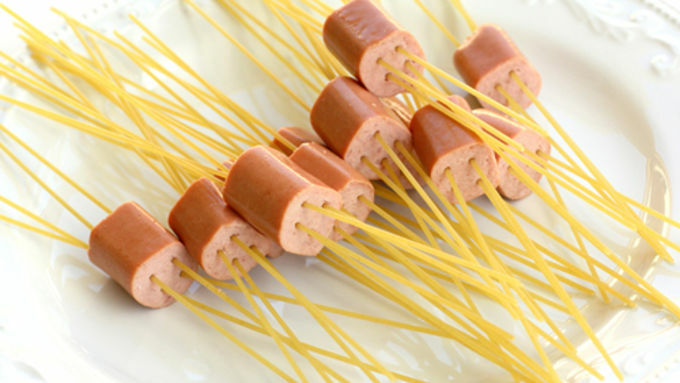 Take four pieces of uncooked spaghetti and pierce through the hot dog with each one. 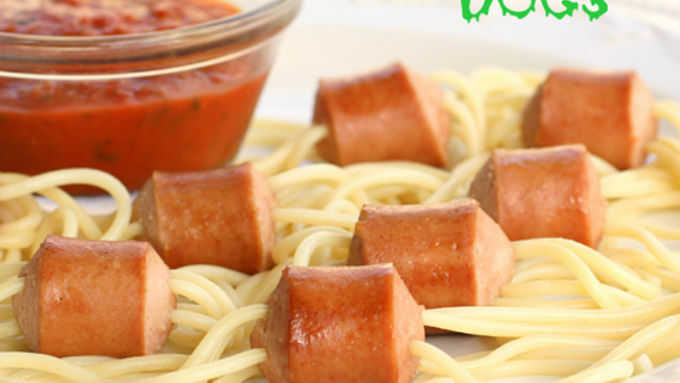 Cook pasta and hot dogs in salted boiling water according to pasta package directions, about 8-10 minutes. 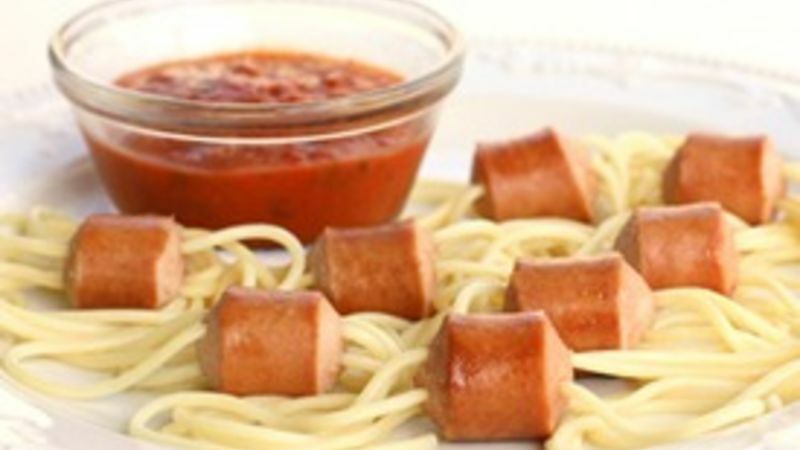 Drain pasta and hot dogs. Serve with warm marinara sauce for dipping or tossed in pasta. These disgusting finger foods will get your kids into the Halloween mood, shock your guests and grossify your party! Halloween is a kid’s dream – costumes, unlimited access to candy, and a free pass to all foul things without being reprimanded by your parents. First, surprise and delight your kids with Spider Dogs! So easy to make, but so fun to eat. Dip these in warm marinara sauce for a messy fun-filled food experience. These are my kid’s absolute favorite. Here are a few ideas to amp up the gross Halloween fun! Before you say “ewww”, just try one of these earwax appetizers. Take some lollipop sticks and put a mini marshmallow on each end. Dip the ends of the marshmallow in melted butterscotch chips for ooey, gooey earwax bites. To make these stuffed cockroaches, slice a date in half and fill it with a teaspoon of sweetened cream cheese. You can amp up the gross factor by placing plastic cockroaches around your serving dish. These cheesy eyeballs take less than a couple of minutes to make. Take fresh mozzarella balls and top them with sliced pimento olives for an appetizer that has its eye on you! Uncivilized and grotesque, these finger foods are perfect for any Halloween party. Looking for more Halloween ideas? Try our collection of spooktacular recipes!